That the brutal excesses of the conflict in Syria, well into its sixth year, have proven capable of causing one of the greatest forced migrations since the end of World War II should serve as a harrowing reminder of the lasting need to reinforce the international system of refugee and migrant protection. The tragic phenomenon of forced displacement, present throughout human history, persists well-into the 21st century, and its effects may be felt on every continent. It is therefore unfortunate that it took a humanitarian disaster of such a scale as last year’s mass influx of refugees on European soil in order to once again spark genuine debate concerning these issues. We should therefore use this opportunity to reflect upon the most important developments during what has been called the ‘refugee crisis’ of 2015, as well as to appeal for greater humanitarian efforts in order to alleviate the suffering of refugees and displaced persons across the globe. 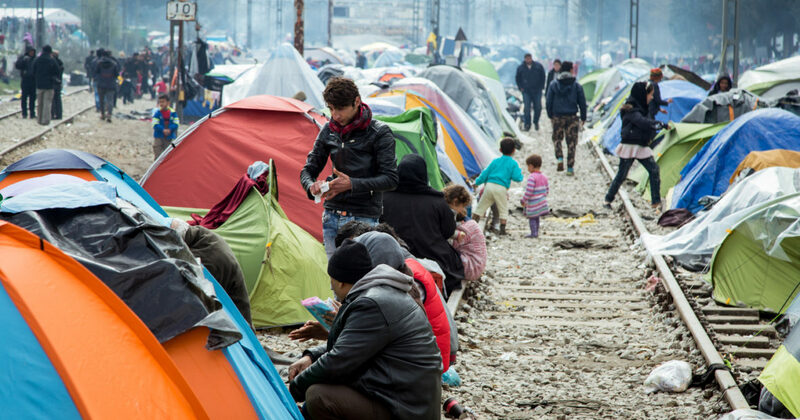 Starting in April/May 2015, the number of new arrivals in Europe began to increase dramatically, with what was called the ‘Western Balkan route’ soon eclipsing the old Mediterranean route in terms of sheer numbers; traveling from Turkey towards Greece, and then northwards through the Balkan countries in order to reach Western and Central Europe gradually became a preferable alternative to braving the dangerous and often lethal voyage across the Mediterranean. Combined with increasing desperation concerning livelihood possibilities in Turkey and other neighbouring countries, the perception that Europe could – and would – provide safe shelter led a record number of Middle Eastern refugees to embark on their journey towards those countries perceived as safe countries of asylum. Over the course of 2015, the number of first-time asylum applicants in EU countries increased from around 562,680 in 2014 to 1,255,685. Most notably, among them there were 362,775 applications by Syrian nationals (whose number tripled from 119,000 in 2014), 178,230 were submitted by nationals of Afghanistan and 121,535 by nationals of Iraq (all statistical data comes from EUROSTAT). These three countries – in addition to others – are considered ‘refugee-producing countries’ by UNHCR, meaning that asylum-seekers coming from them are prima facie likely to fulfil the conditions for refugee status of the 1951 Convention relating to the Status of Refugees (see, for example, the latest UNHCR position papers on the international protection needs of asylum-seekers from Syria, Afghanistan, and Iraq). This unforeseen mass influx situation put European solidarity to the test, both amongst receiving and transit countries, as well as towards refugees themselves. Although the necessity of forming a common European response was recognized early on during the crisis of 2015 and in spite of high expectations concerning the outcome of several EU summits, a comprehensive common policy was not implemented. However, policy towards refugees and migrants travelling along the Western Balkan route did evolve through several distinct stages, usually through joint undertakings by major EU receiving countries and the governments of Western Balkan countries themselves. Following increasingly restrictive regulations concerning access to these countries’ territory – often done in a manner whose conformity with international law was called into question, with certain groups being designated as irregular migrants a priori – this policy culminated in the controversial EU-Turkey deal of March 2016; in light of this deal, Western Balkan states began shutting their borders to refugees and migrants, effectively leading to the closure of the Western Balkan route. This mass influx situation likewise highlighted real or perceived shortcomings in the framework of international refugee law, particularly in the so-called ‘transit context’, wherein many persons who likely met the criteria for refugee status in line with article 1 (A) (2) of the 1951 Convention relating to the Status of Refugees, facing asylum procedures that were often dysfunctional and poor perspectives of integrating into the local community, declined to seek asylum in countries which they were merely transiting through prior to reaching the ones they perceived as being safe countries of asylum. This situation sparked debate as to the extent of these states’ obligations under international refugee and human rights law, including respect for the principle of non-refoulement, the legal safeguards in forced returns procedures and the related issue of ensuring access to their territory to such persons. The events of 2015 have highlighted more than ever the need not only for States as such to cooperate in resolving issues with global implications, but also the necessity of fostering cooperation between state authorities and civil society in order to ensure full respect for relevant standards of international law. Such cooperation was often difficult during 2015, with issues such as whether the term ‘refugee’ was preferable to ‘migrant’, often overshadowing more pressing issues such as ensuring these persons’ safety and dignity. Every policy solution in this regard must conform to international law at all times, in particular to such fundamental norms as the jus cogens principle of non-refoulement. Above all, the refugee crisis of 2015 has demonstrated to what extent making predictions with any level of precision is impossible in the field of forced displacement; this should be a reminder to policy-makers that only long-term planning and preparation may lead towards adequate migration management and ensuring full legal protection for persons who meet the conditions for being granted asylum either as a matter of international refugee law or human rights law. Furthermore, notwithstanding the special protection granted by international law to refugees as persons fleeing persecution on various grounds, all migrants remain protected by the overarching norms of international human rights law; their urgent humanitarian needs must be addressed and all proceedings governing their status or potential forced return must be in line with human rights standards. The persistent influx of persons in need of international protection arriving to the shores of Europe should likewise not be an excuse to disregard the situation of refugees elsewhere. Millions of refugees from Syria and Iraq remain in neighbouring countries such as Turkey and Lebanon, often in conditions of extreme poverty, and their number greatly exceeds that of refugees who have so far arrived in Europe. All around the world, protracted refugee situations continue to leave millions of human beings living in inhumane conditions with little or no prospect of local integration. To mention a few noteworthy situations, Pakistan and Iran have hosted millions of refugees fleeing subsequent conflicts in Afghanistan for decades; tens of thousands of refugees and internally displaced persons, a legacy of the conflicts in the former Yugoslavia, continue to face a lack of durable solutions many years after said conflicts came to an end; and hundreds of thousands of Somali refugees have been living in Kenyan refugee camps since the early ’90s (many of whom may now be repatriated). These situations should serve as a warning to the international community, so as to hopefully avoid another wave of refugees living in limbo for years to come. Pavle Kilibarda (L.L.M. Geneva Academy) worked at the UNHCR office in Belgrade and the Belgrade Centre for Human Rights, engaging principally with the legal position of refugees and asylum-seekers in Serbia. He is the author of several publications dealing with international refugee and human rights law and has spoken in various media outlets.